Mix everything up good in a pitcher. 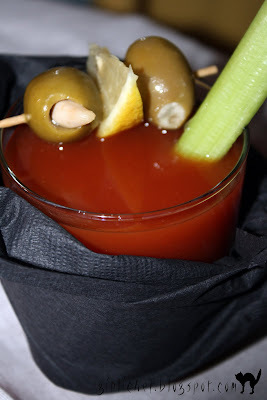 celery stick ...and olives if you're anything like me Stir with a celery stick...pour into glasses and enjoy!! Wrap with a square black napkin folded diagonally to make a cape if it's Halloween...or if you're just in the mood. Ginger Pom..add a little blood to the rim! 2 parts pomegranate juice POM! Mix 'em all together...serve over ice if you wish. 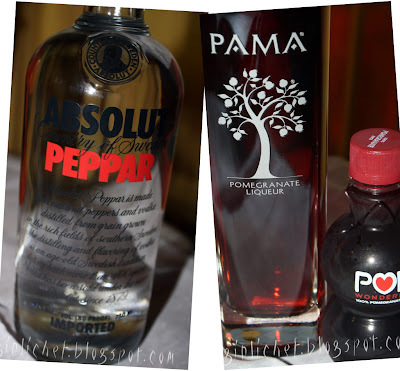 Leave out the Pama for a non-alcoholic treat...but it's really, really good with it. Lush. Don't forget the red gel icing, er...uh...I mean blood around the rim! 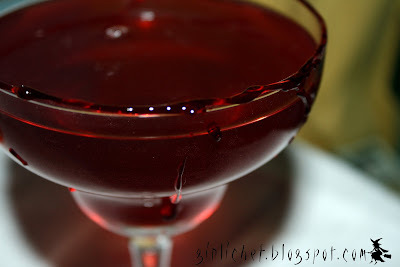 Betcha didn't guess that this is my I Heart Cooking Clubs entry this week...where our theme is Spooky Treats & Spirits...using the recipes of Nigella Lawson! !